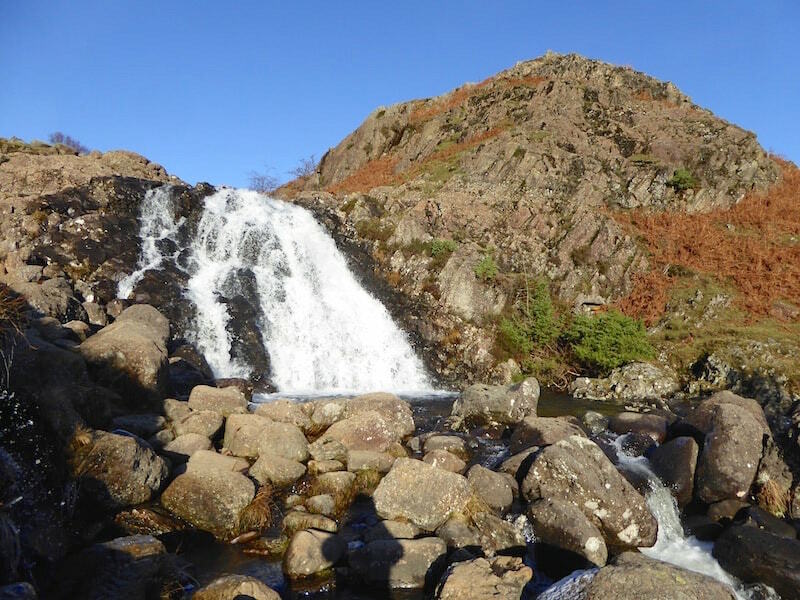 After 3 weeks of constant rain, wind and general weather unpleasantness it was good to be out again. 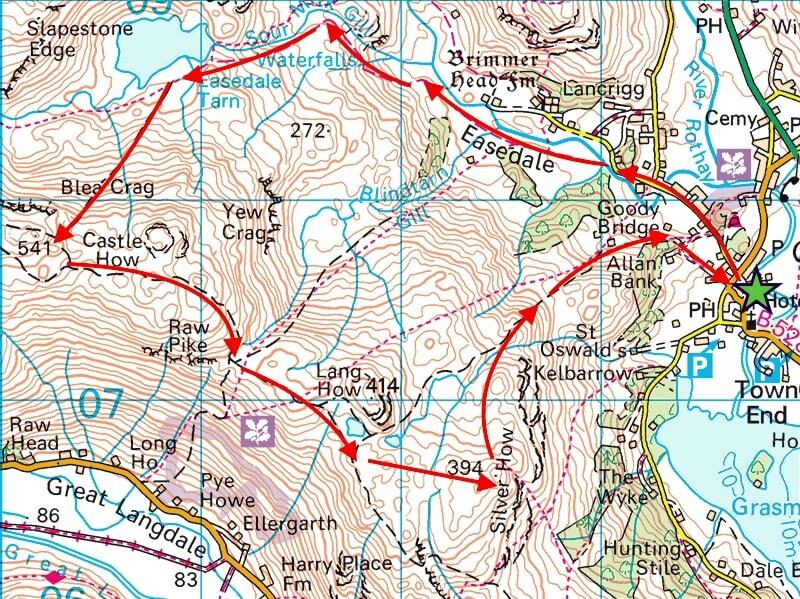 The Blea Rigg ridge is our destination today so off we went to Grasmere to take a walk up to Easedale Tarn, from there we’ll climb up to Blea Rigg, continue on to Silver How and then take the Allan Bank path back to Grasmere. 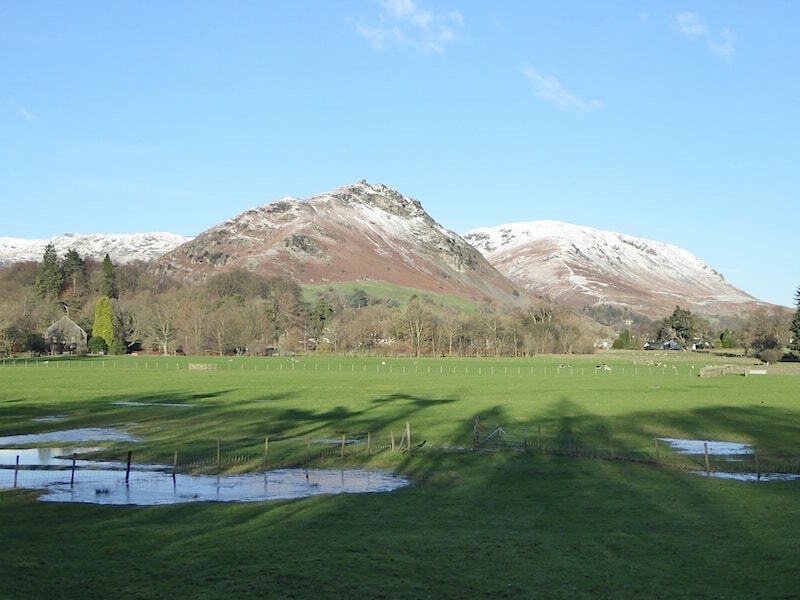 Over there is Helm Crag with Steel Fell behind it as we cross the field from the A591 lay-by into Grasmere. 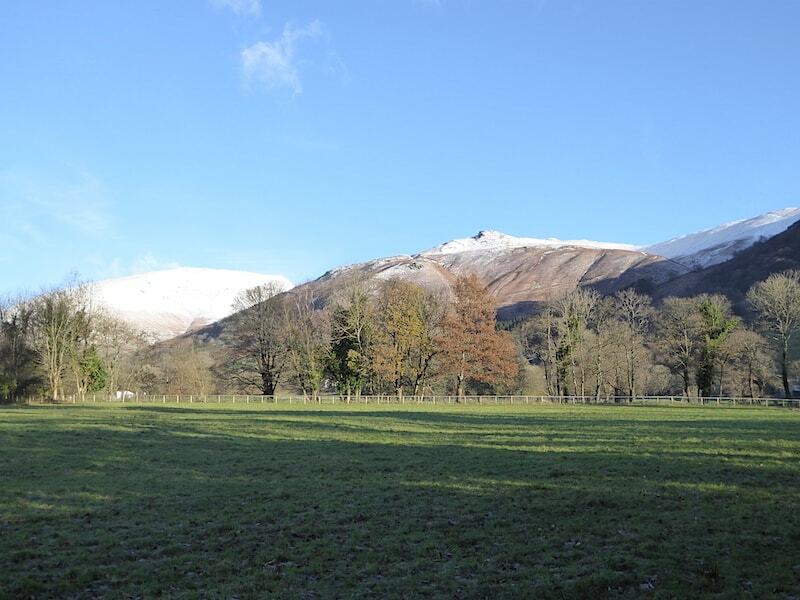 A dusting of snow fell overnight and covered the fell tops. 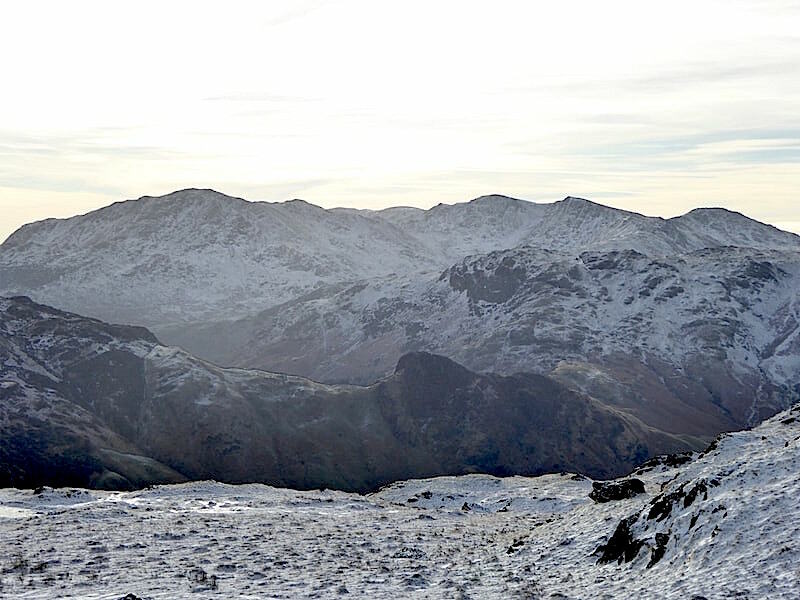 Its cold and its icy, but who cares, its dry, its sunny, and the fells are waiting. 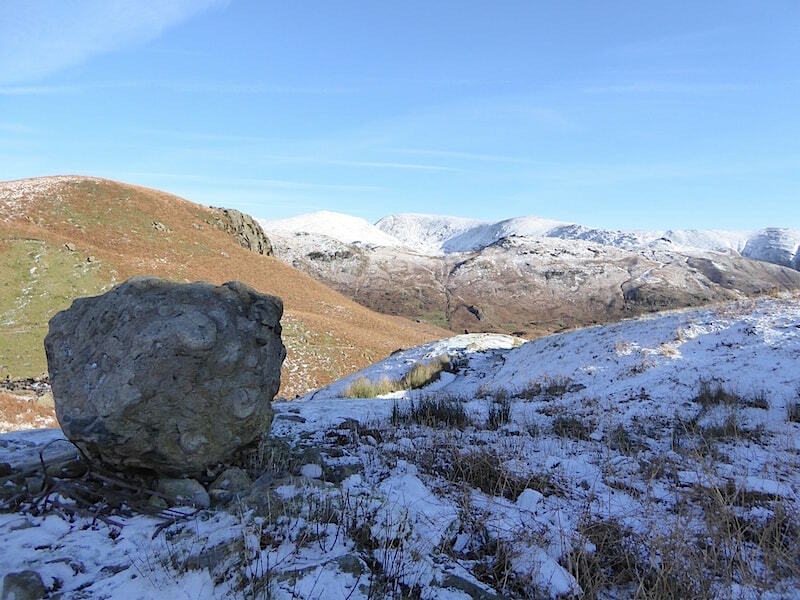 Stone Arthur with a very snowy Seat Sandal behind it. 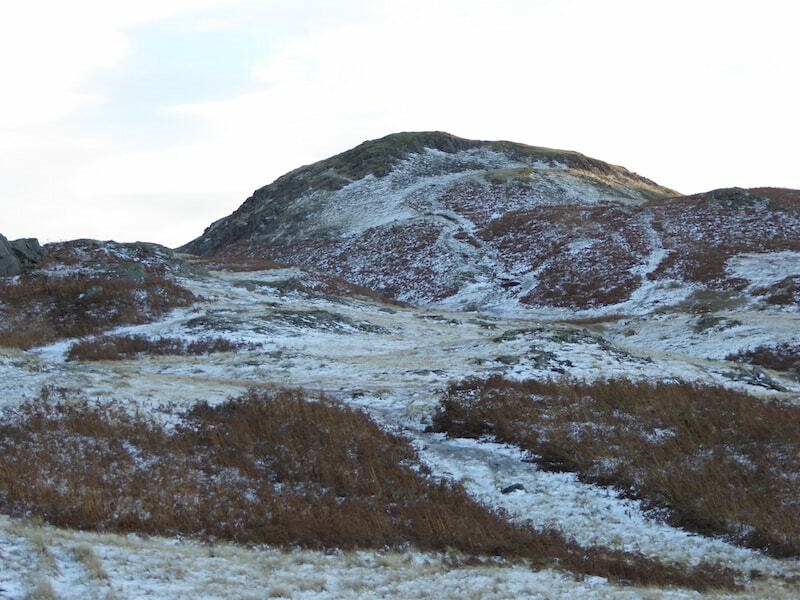 Stone Arthur again this time with Great Rigg showing just behind it. 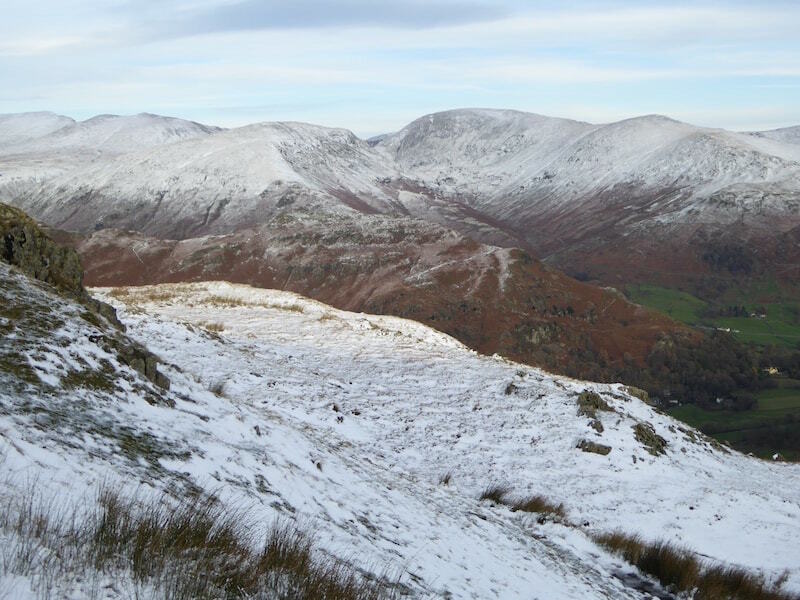 A look back down Easedale. 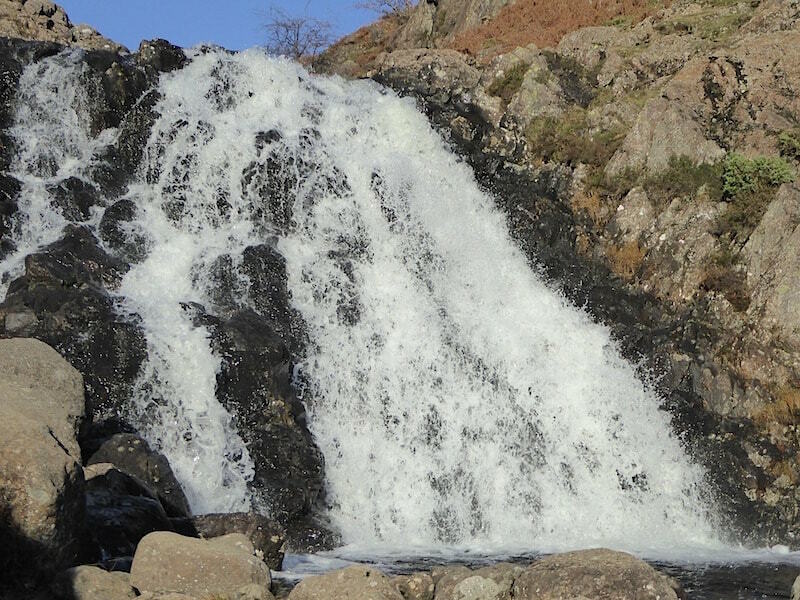 A closer look at the falls …..
….. and an even closer one. 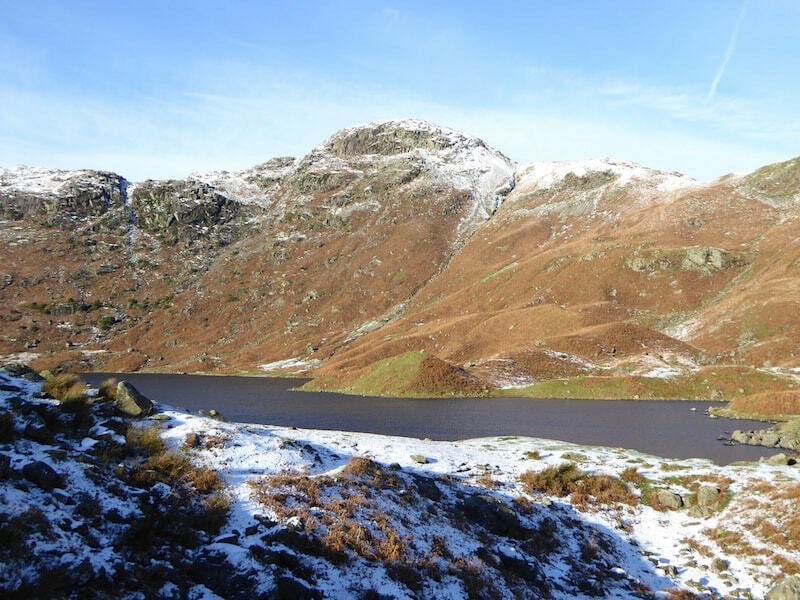 Easedale Tarn with Tarn Crag rising above it. Not many people here today and the few that were turned back once they had reached the tarn. 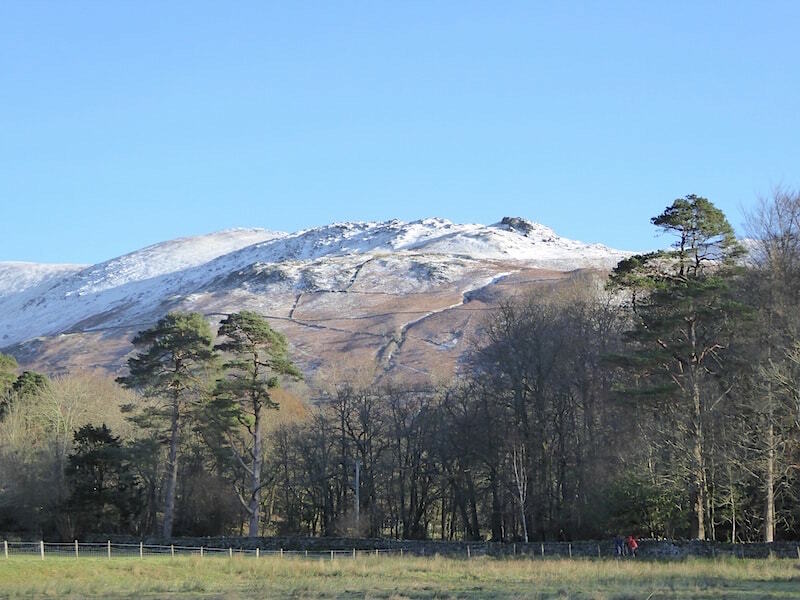 From the site of the old refreshment hut a view across to the eastern fells. 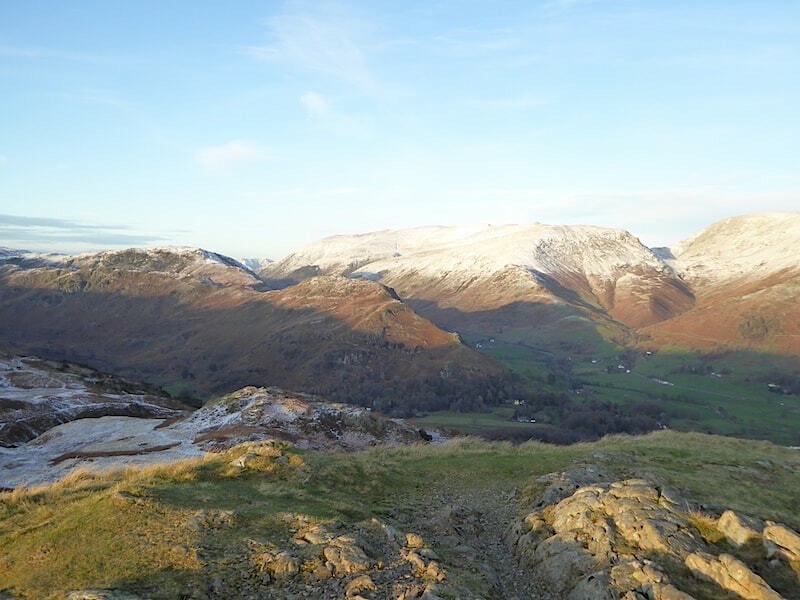 On the skyline from left to right are Seat Sandal, Fairfield and Great Rigg. 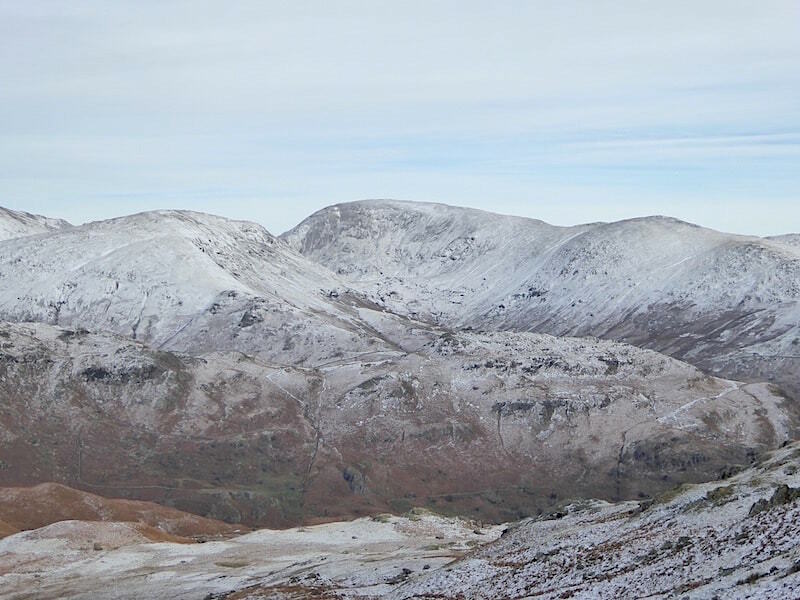 Plenty of snow on these higher fells today. 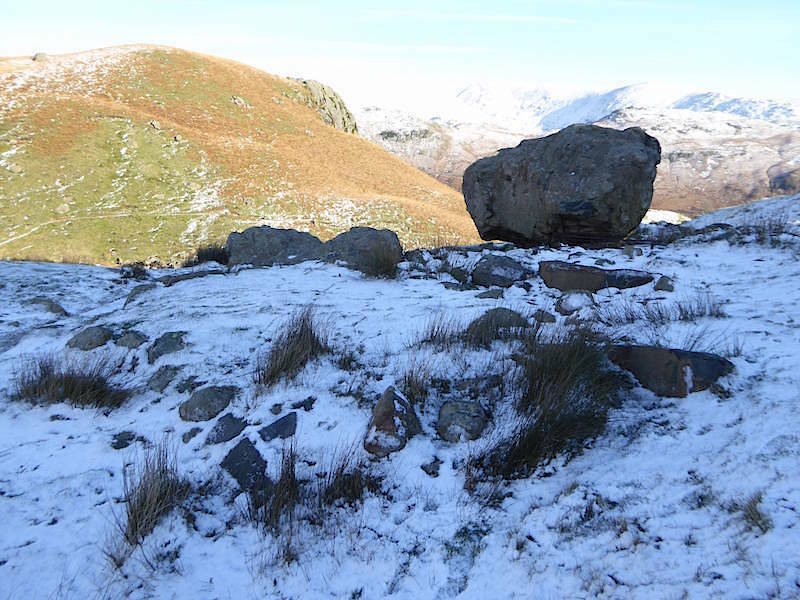 The foundations of the old refreshment hut can still be seen but picking them out in the snow is a bit tricky today. 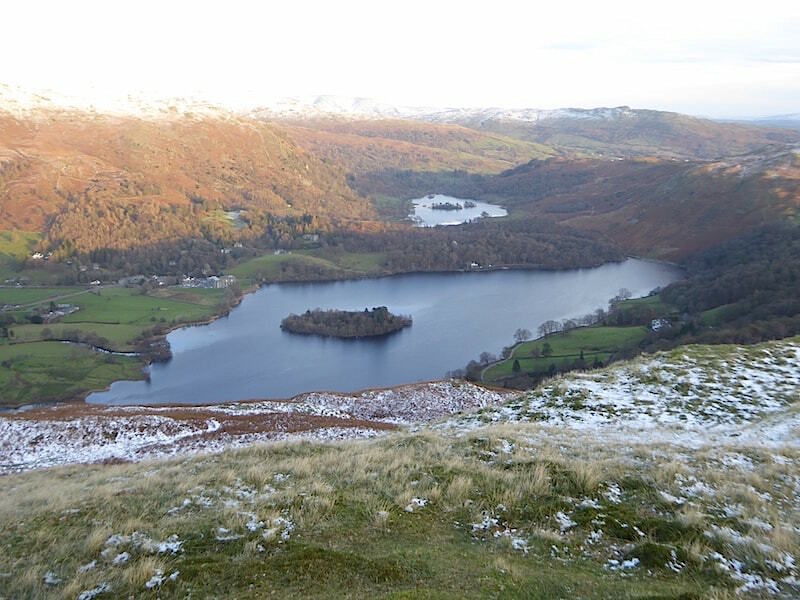 A view of Tarn Crag as we take a break for a few minutes. 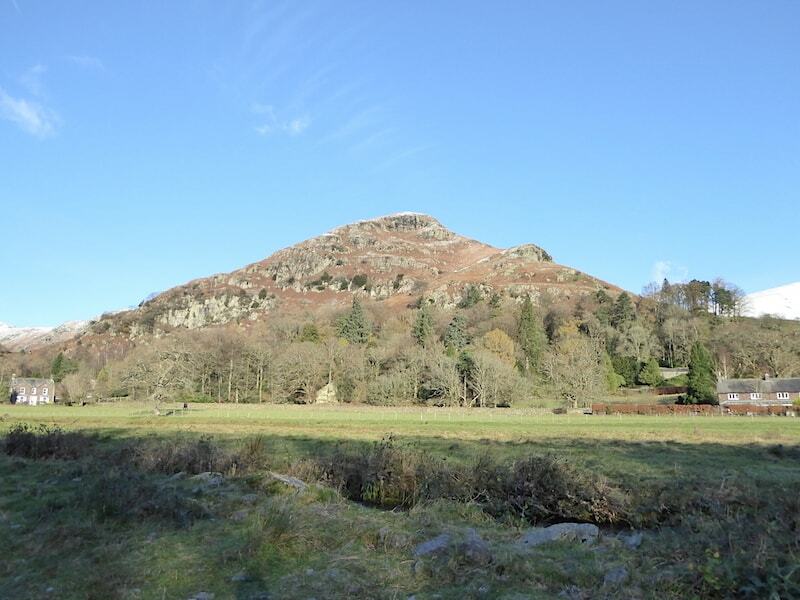 The dark, rocky outcrop of Blea Rigg, up there on the far left of the skyline, is where we are heading next. Now we’ve gained some height we have a better view of the whole of the tarn. 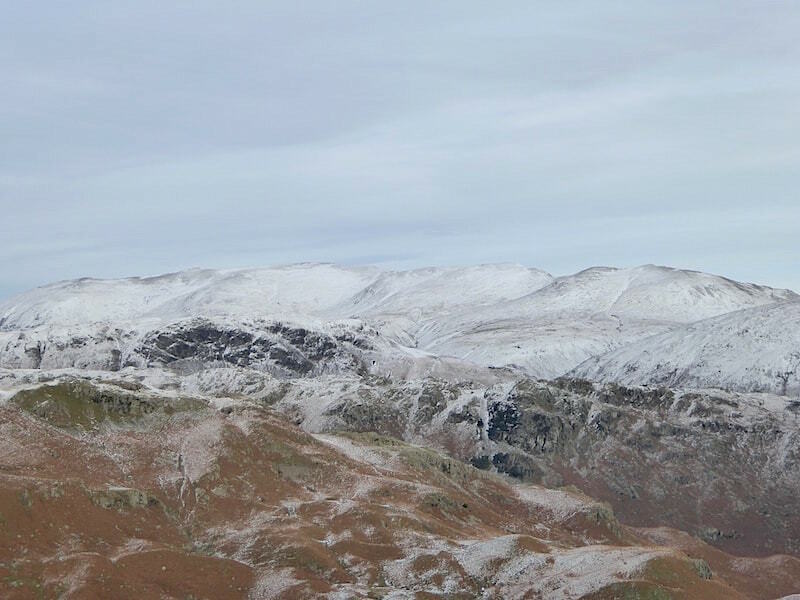 The Helvellyn range is beginning to blend in with the cloud which has come over. Pity about that as it takes away a bit of the sparkle. 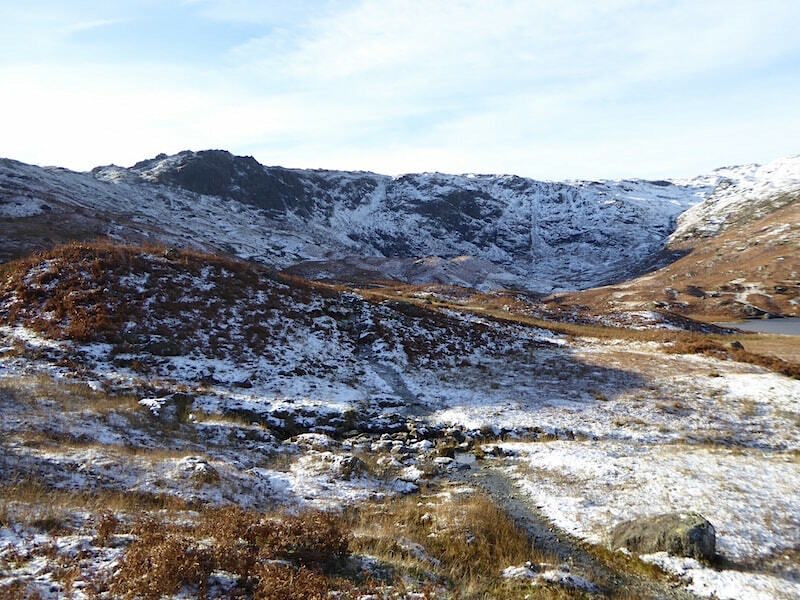 Progress was slower across here, it was icy and squelchy in equal measure, so we had to do lots of zig-zagging. 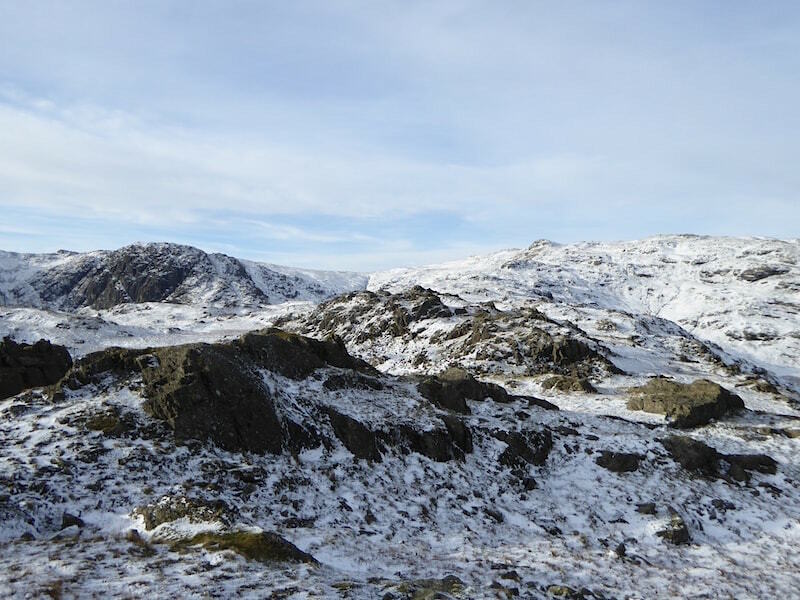 A close up of Seat Sandal, Fairfield and Great Rigg. 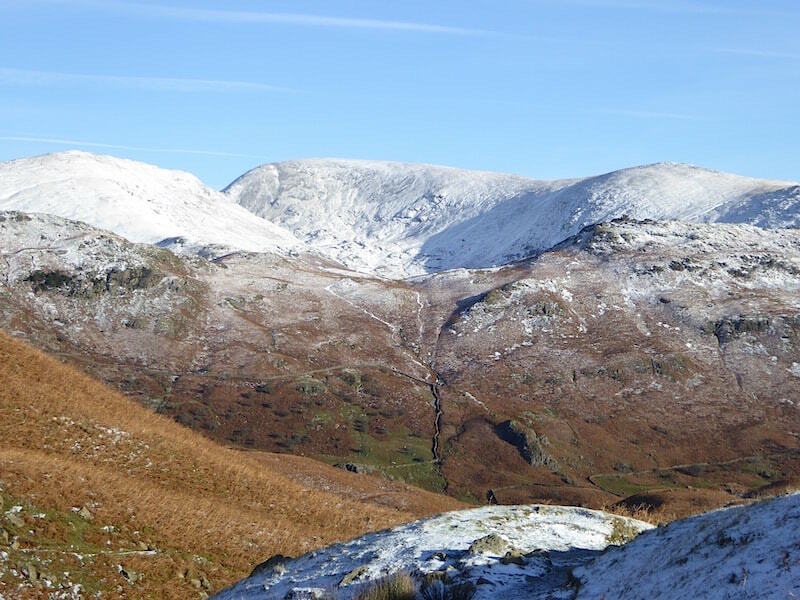 The Helvellyn range on the skyline, wonder if it was busy up there today? A burst of sunshine again as we reach the ridge so I took a look back at the view. 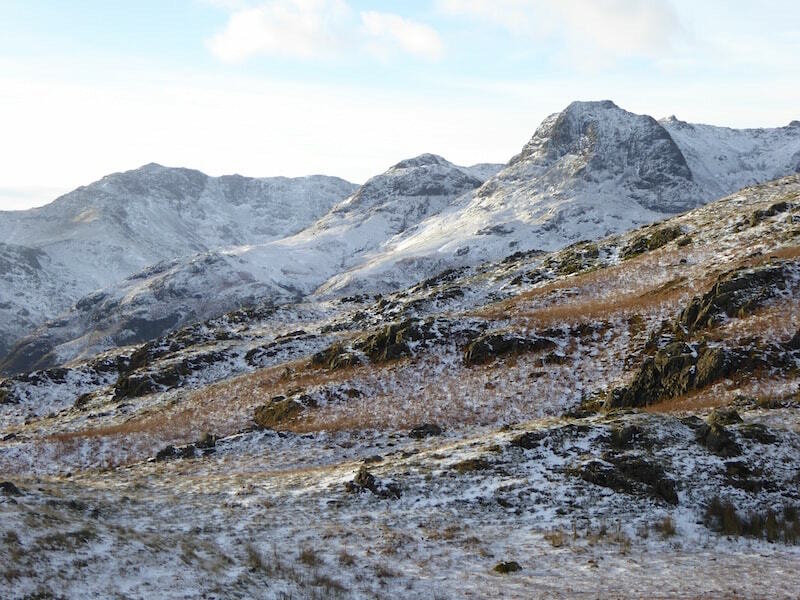 Moving southwards along the ridge and Harrison Stickle puts in an appearance over on the extreme right. Never a good idea to shoot straight into the sun I know, but I think I got away with it, thanks to the thin cloud. 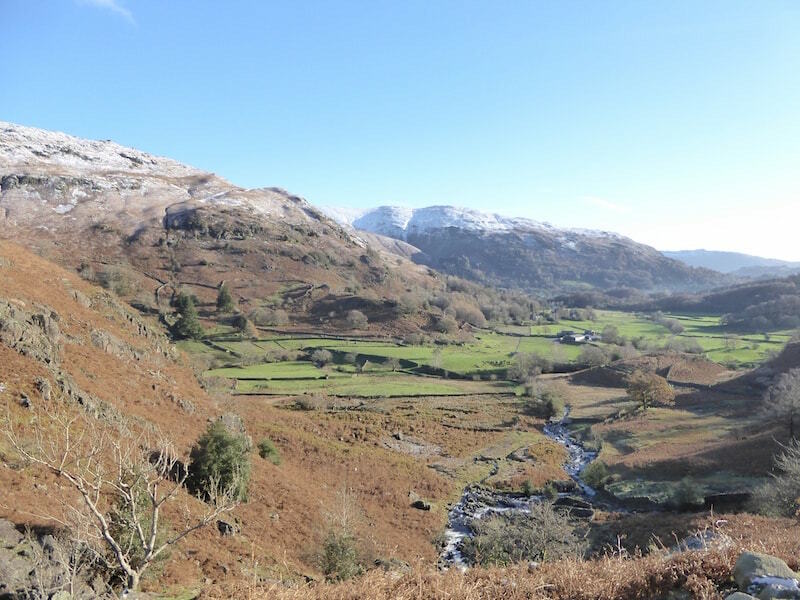 This is looking over towards Wetherlam, over on the left skyline, and its neighbouring fells. 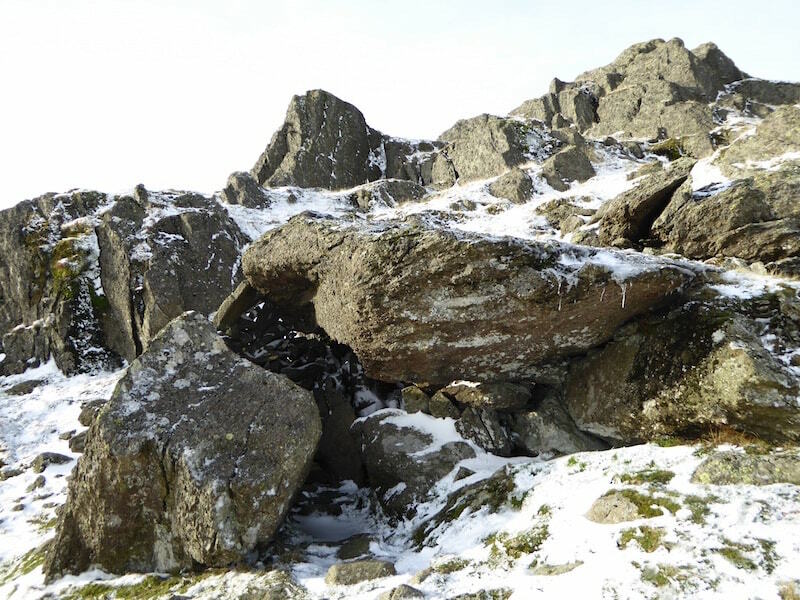 On the way up to Blea Rigg we pass the split boulder which has been fashioned into a shelter. Very small inside and difficult to get into but I suppose you’d be glad of it in an emergency. 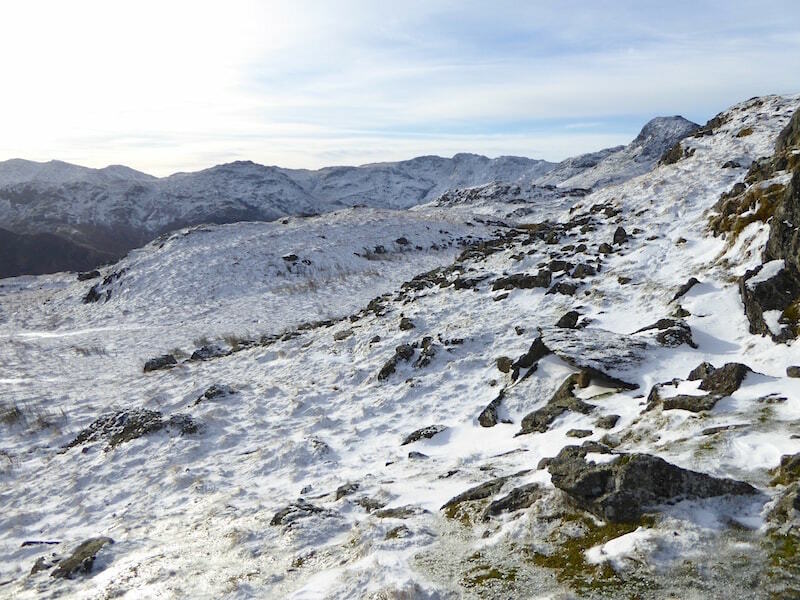 Ahead of us is Harrison Stickle on the left and Pavey Ark over on the right. 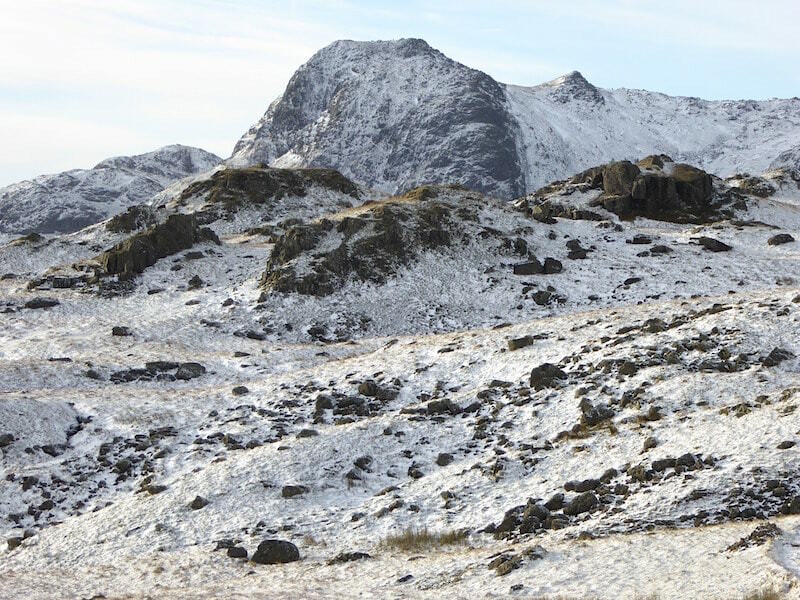 Moving to the right a little, now Pavey Ark is over on the left and the knobbly lump over on the right skyline is Sergeant Man. 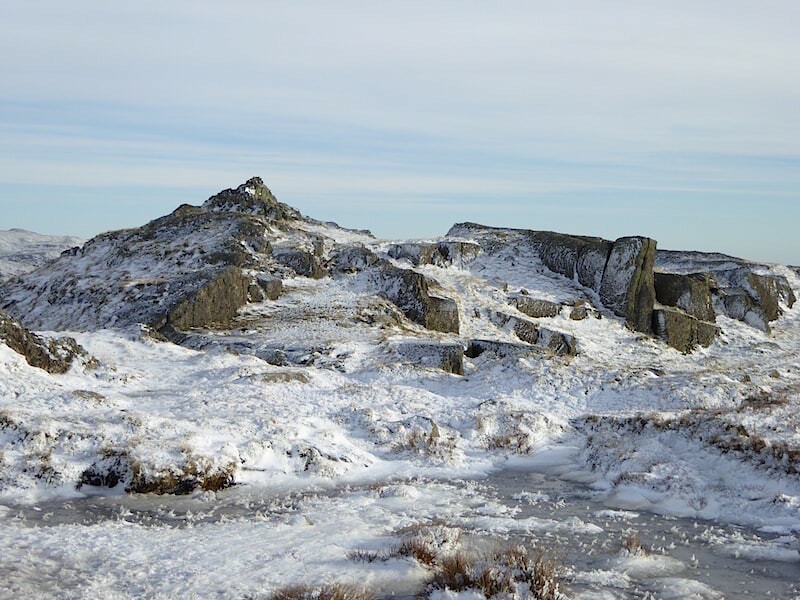 Its all lumps, bumps and rocks up here, plus a whole lot of frozen pools. 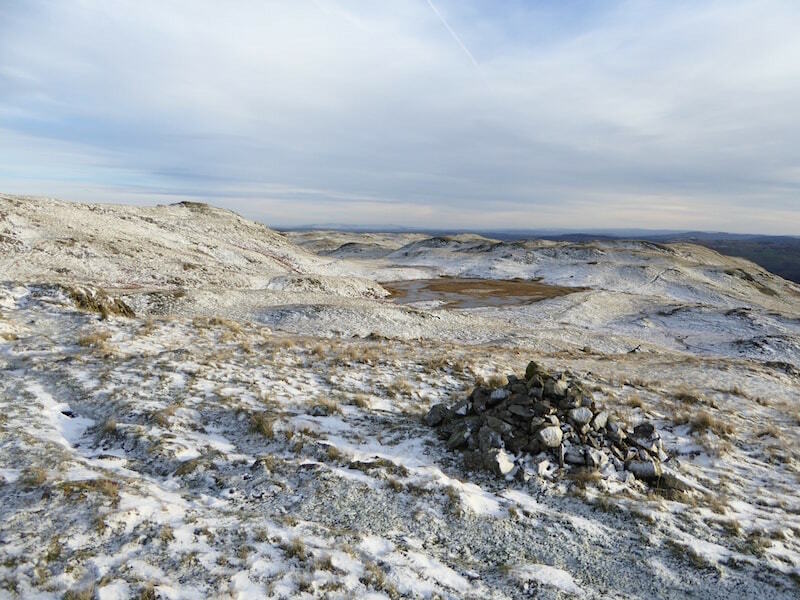 This is the top of Blea Rigg looking eastwards. 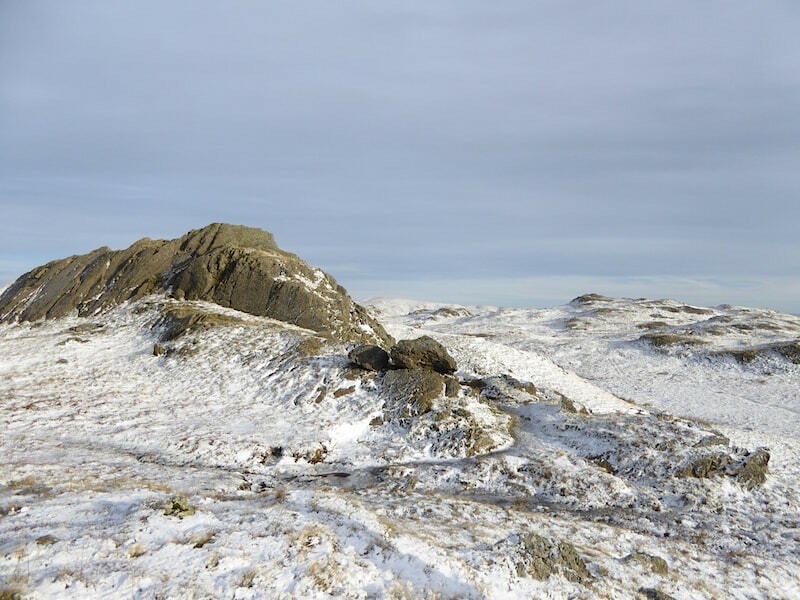 Blea Rigg summit and a good bit of ice dodging needed to get to it. 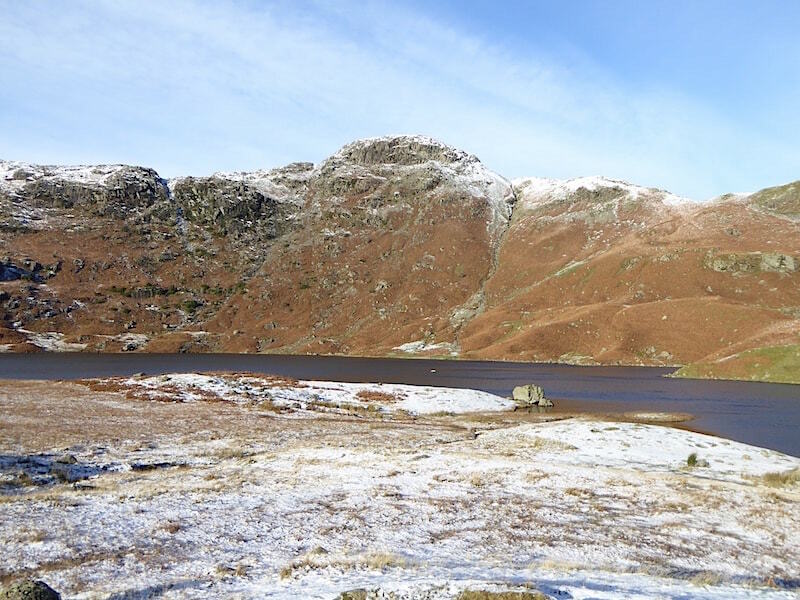 Just one of the ‘ice rinks’ up here today, not frozen solid either so lots of care needed to avoid getting a bootful. 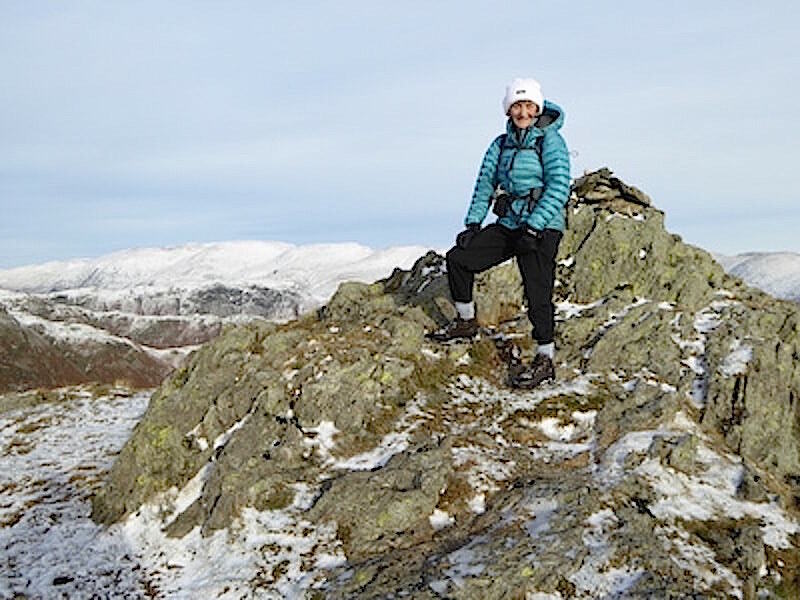 Safely through and time for a sit down on Blea Rigg summit after all that ice skating. 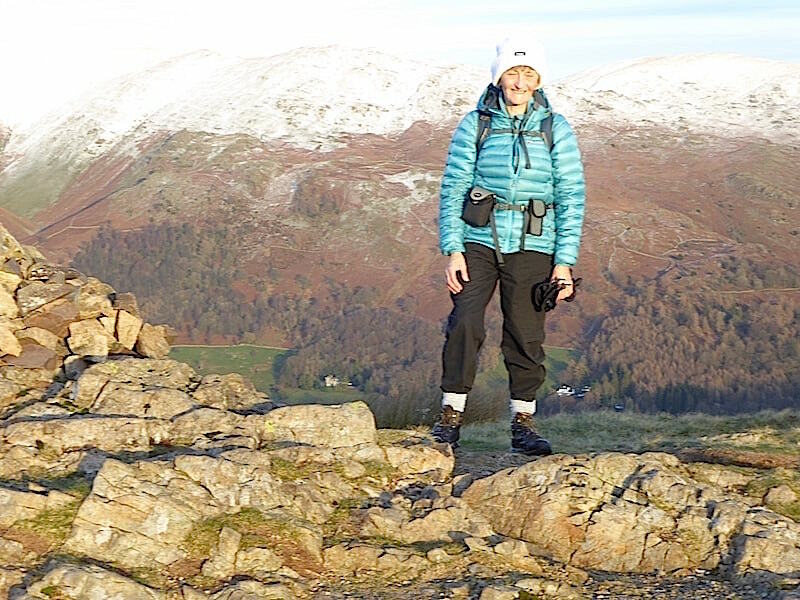 Fully kitted up today and all of it needed, the sun couldn’t quite compensate for the freezing air but it was nice to have it anyway. 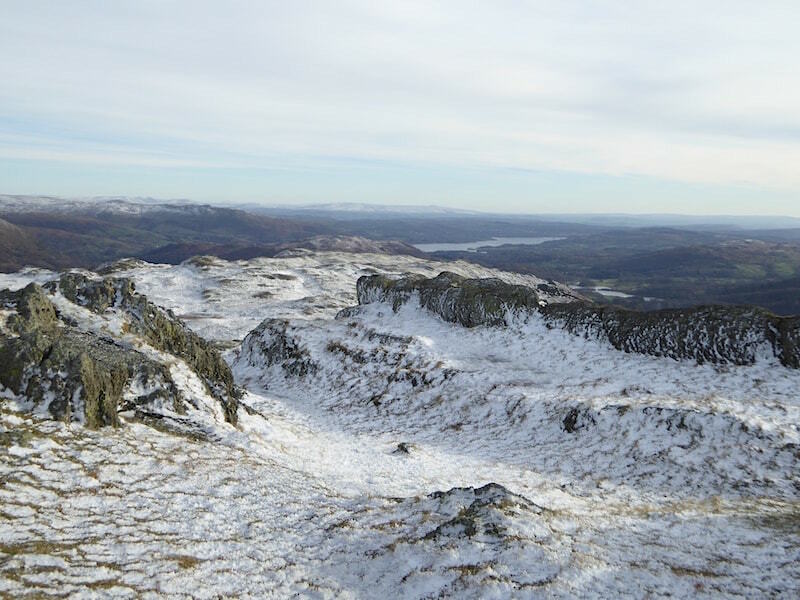 There’s Windermere beyond the snowscape, notice the absence of snow down at ground level. Moving along the ridge and making our way down to Silver How. 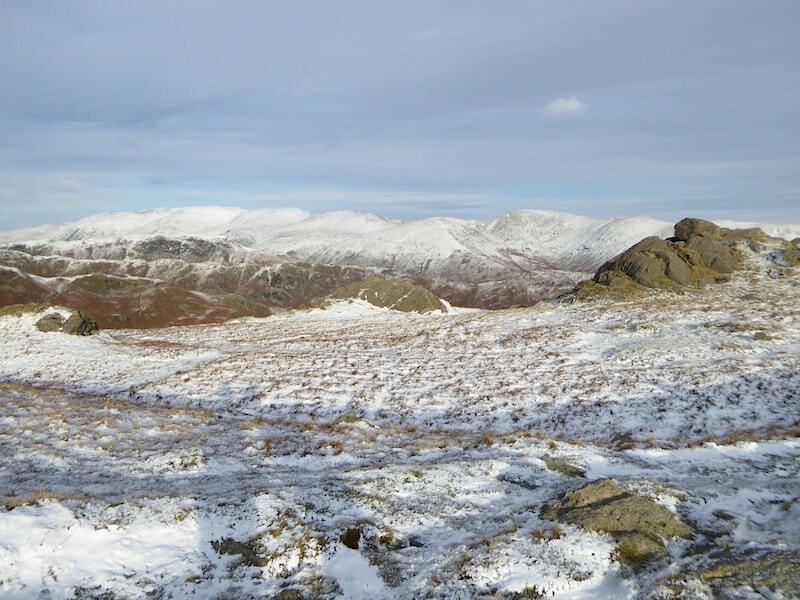 The snow covered eastern fells over in the distance. 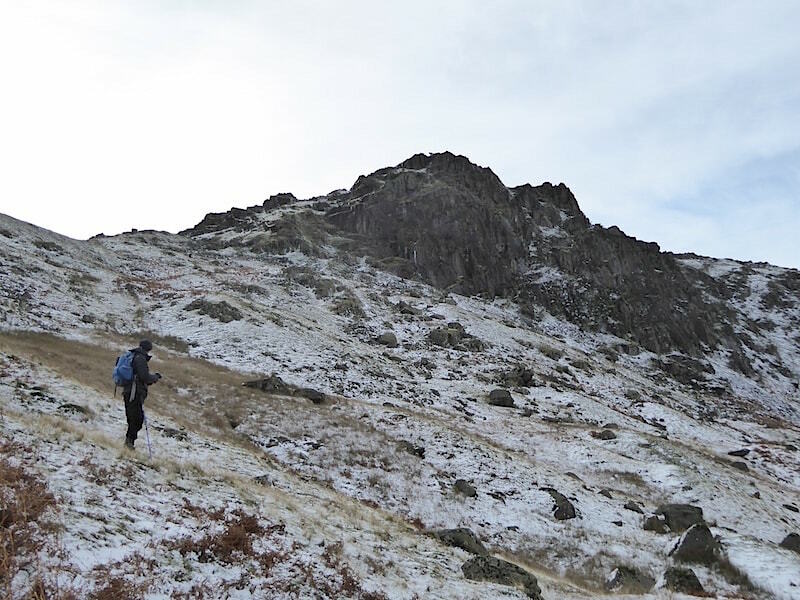 Still plodding along the ridge and trying not to step into any of the dozens of ice cold puddles along the way. Its a confusing place even on a good day like today, paths everywhere, outcrops too big to see round or over, not a good place to be when the cloud is down. 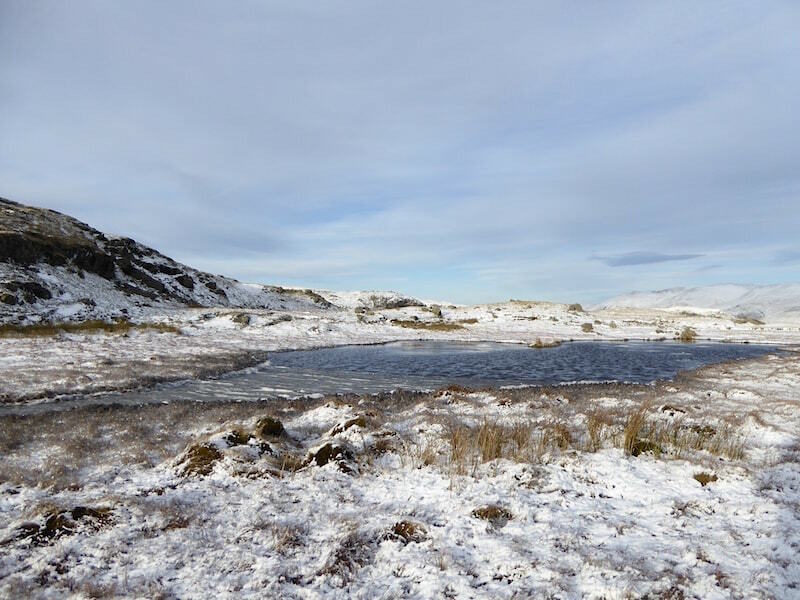 One of the tarns below Great Castle How, not quite frozen over as you can see from the ripples. 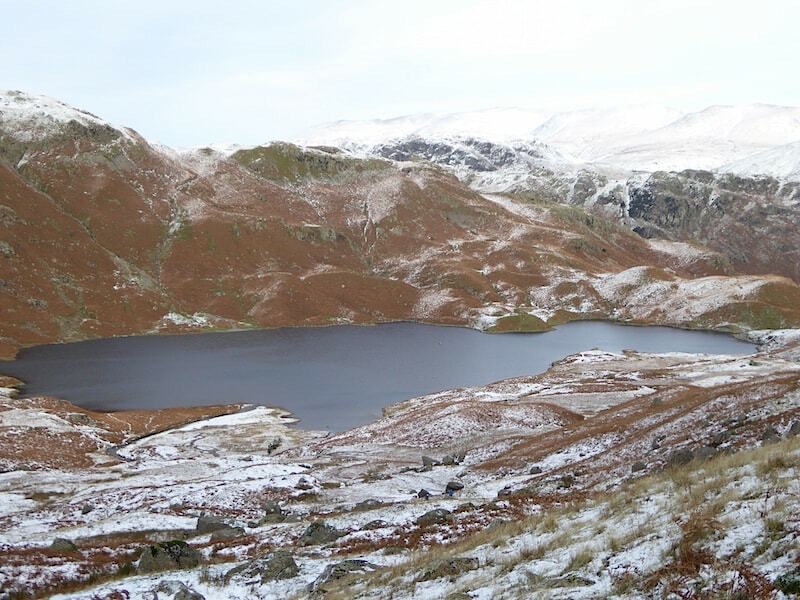 The same tarn from a different viewpoint. The walkers on the other side had German/Austrian accents and had asked us for directions a few minutes earlier. Sensibly they stuck to the path we pointed out, unlike ourselves who squelched across here just to get a different view of the tarn. It may not look soggy but it most definitely was. 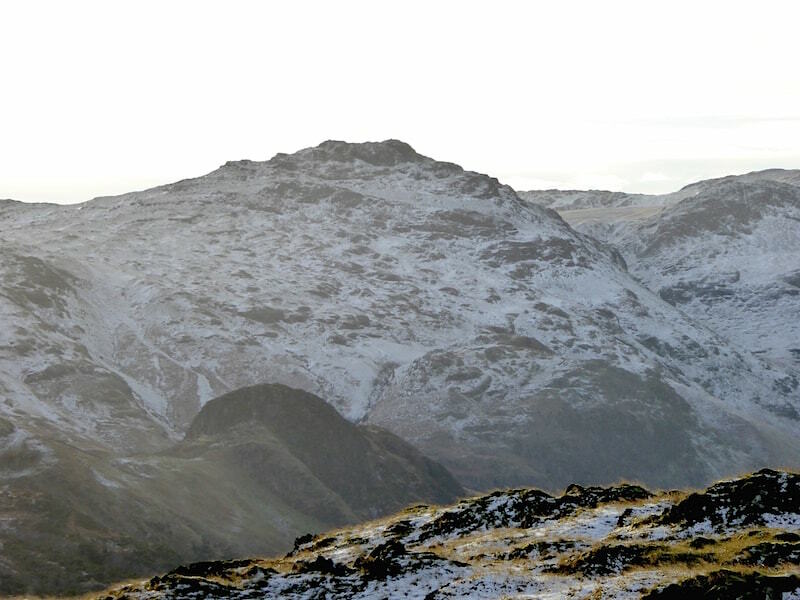 The menacing bulk of Harrison Stickle. 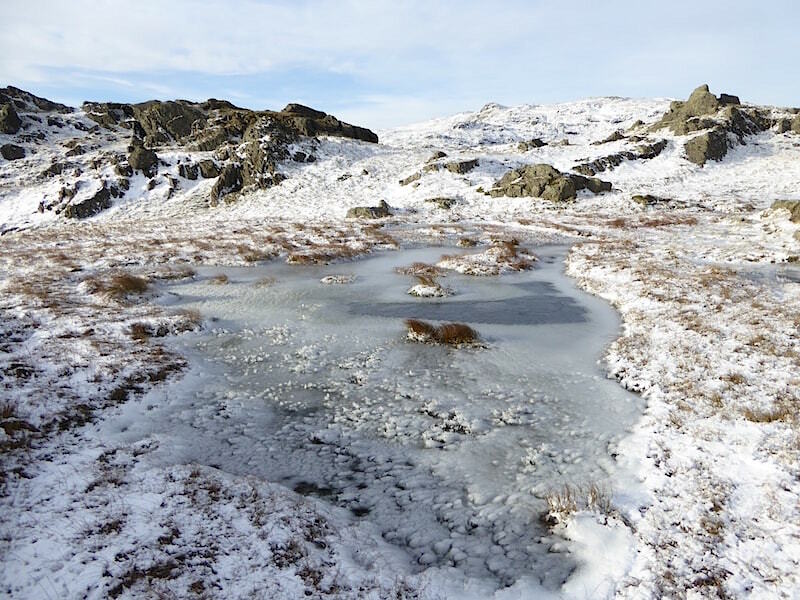 Another semi-frozen tarn along the ridge, it was really difficult to get a move on along this ridge today and it seemed to take a lot longer than usual. 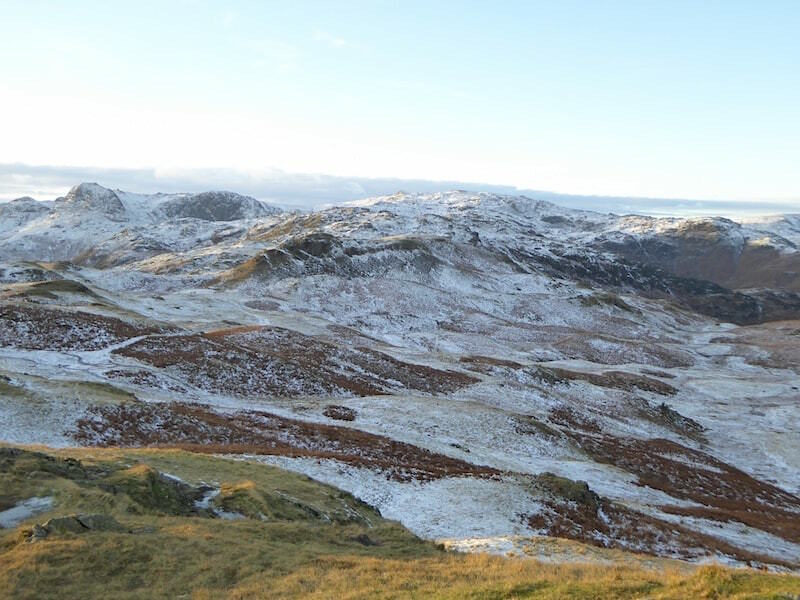 The eastern fells again, what a pity that the cloud is making it all look a bit dull. 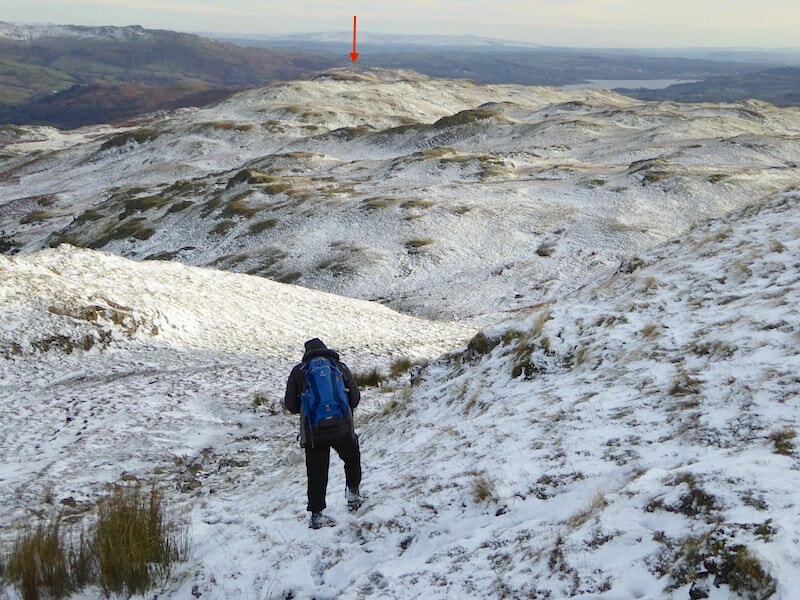 There’s still a bit of distance to cover before we get to Silver How, that’s the one below the arrow, but it wasn’t easy to move quickly over the slush and the ice. 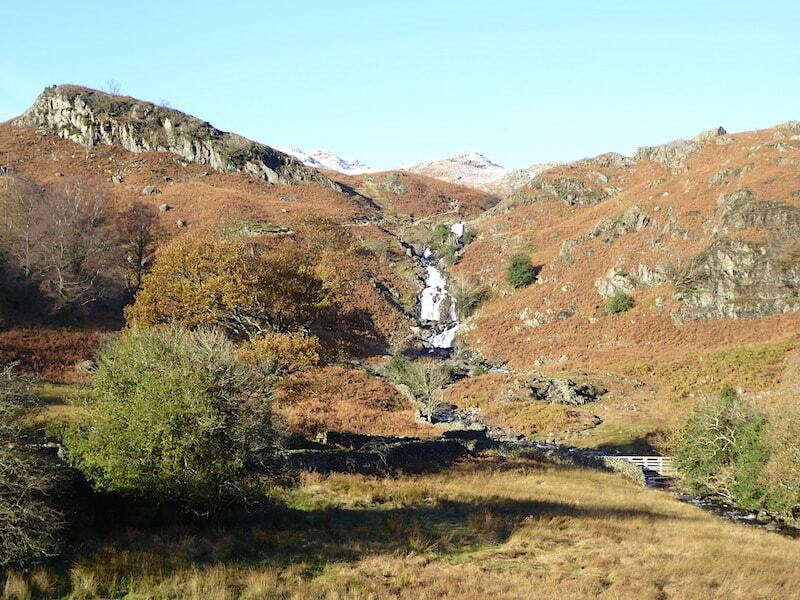 A bit of sunshine always helps to put a spring in your step, and we stride out over to that brown area in the centre. 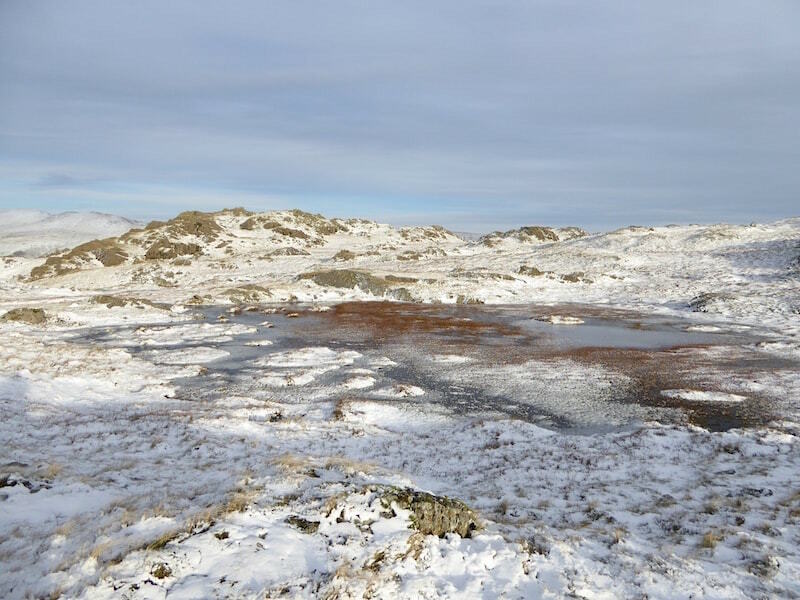 Its a large, reedy tarn below Lang How. 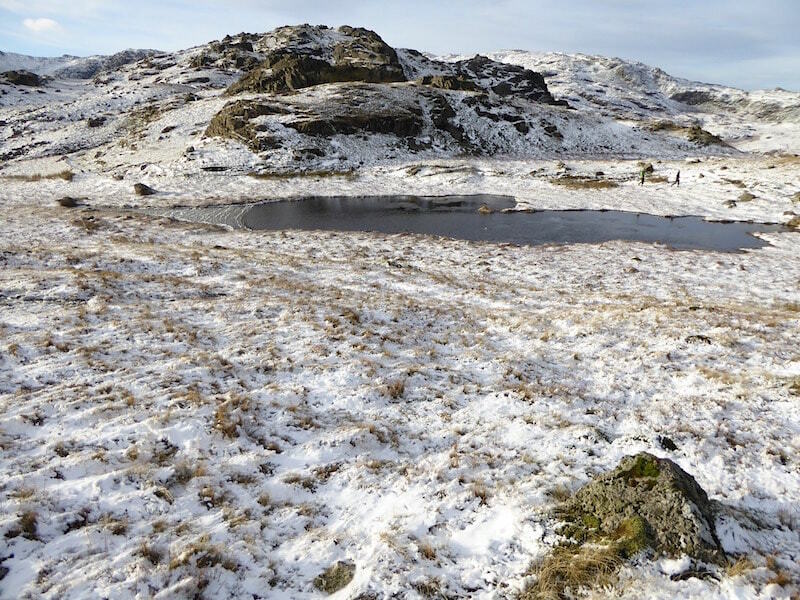 Lang How is the rocky top to the left of the tarn. 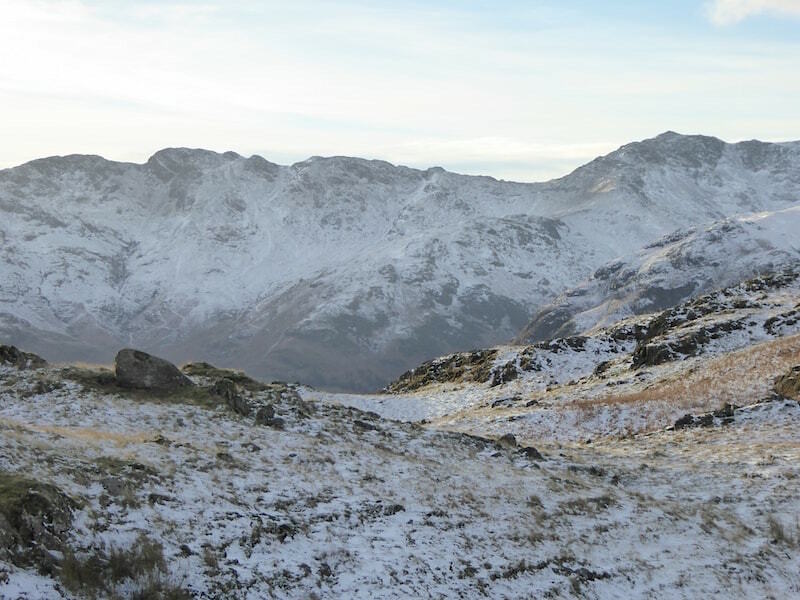 Turning a little further to my left and Bowfell is now over on the right with Crinkle Crags taking up the left side. 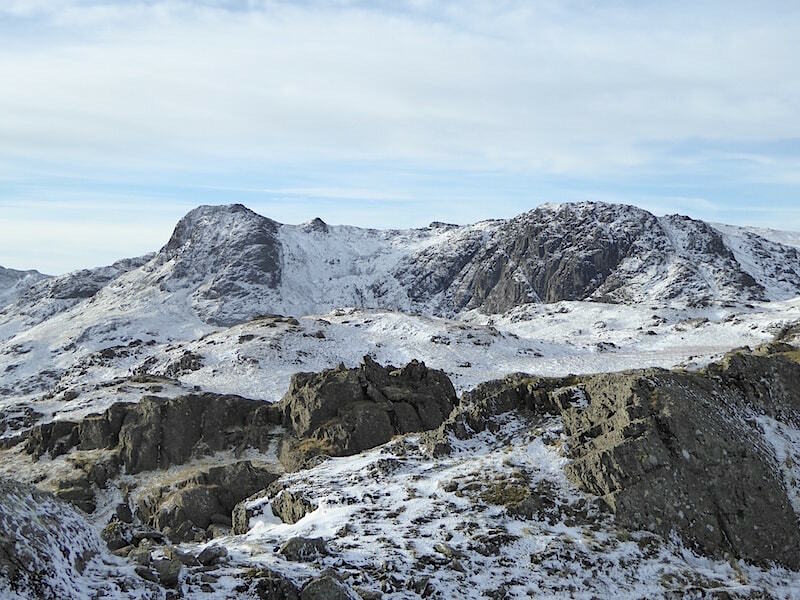 A close up of Pike O’Blisco which is dwarfing Side Pike, its diminutive neighbour down below it. 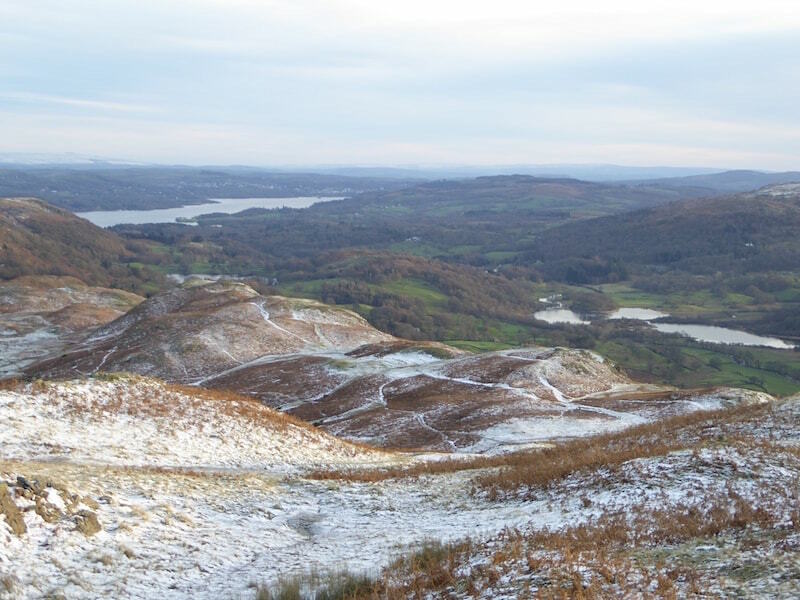 Windermere over on the left, Elterwater over on the right, and in between, with its maze of paths is Loughrigg Fell. 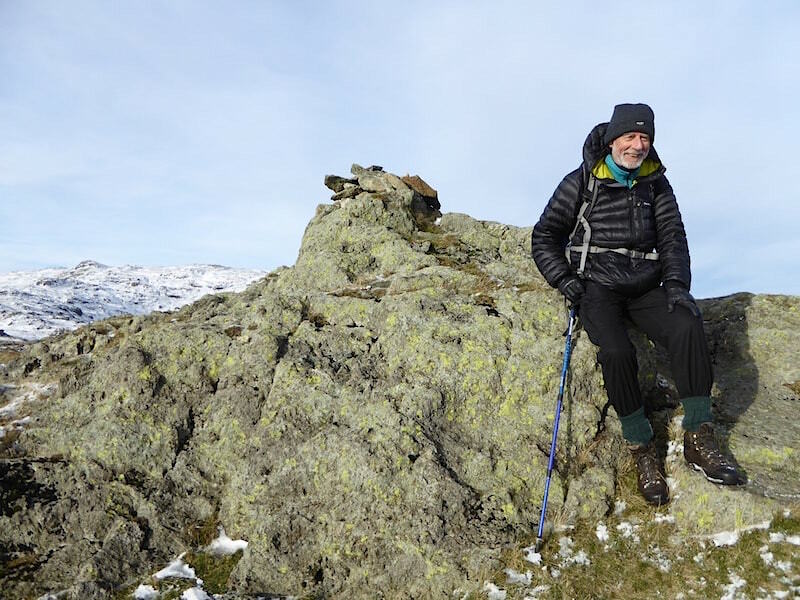 Silver How is not far away now …..
….. practically just around the corner, with Seat Sandal and Fairfield providing the backdrop. 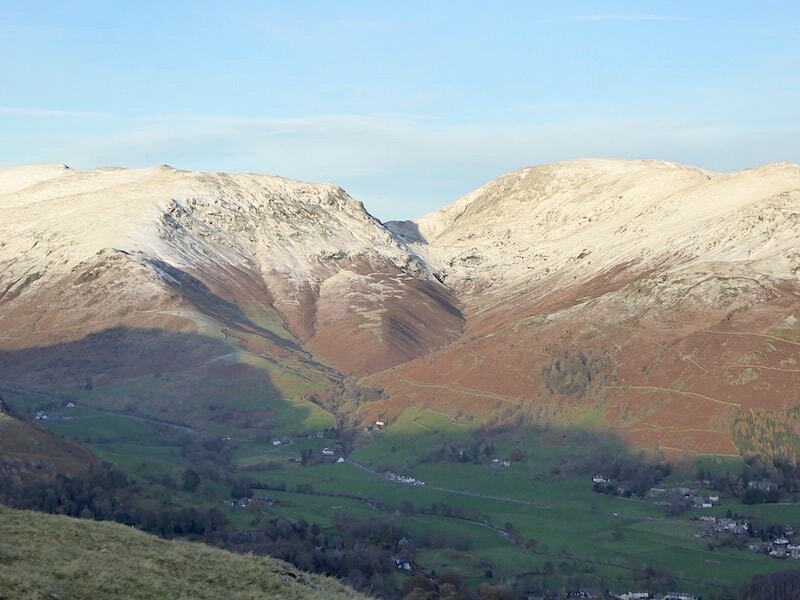 A closer look at Seat Sandal and Fairfield, looking very attractive in the soft afternoon light. Silver How bathed in golden light now that the sun is beginning to set. I should perhaps mention that it is only 3.15 pm and already it feels like the day is over. 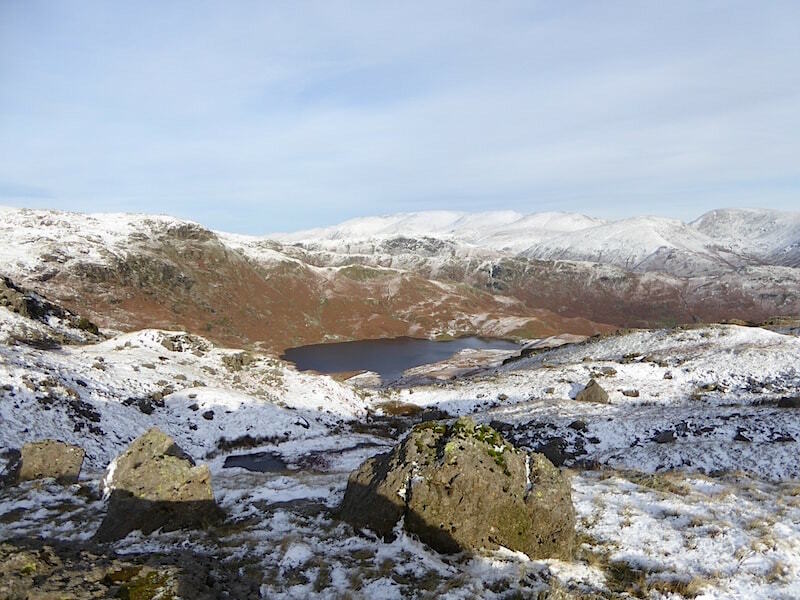 From Silver How summit a view down to Grasmere, with Rydal Water beyond. From Silver How summit a look back at where we’ve been walking today. 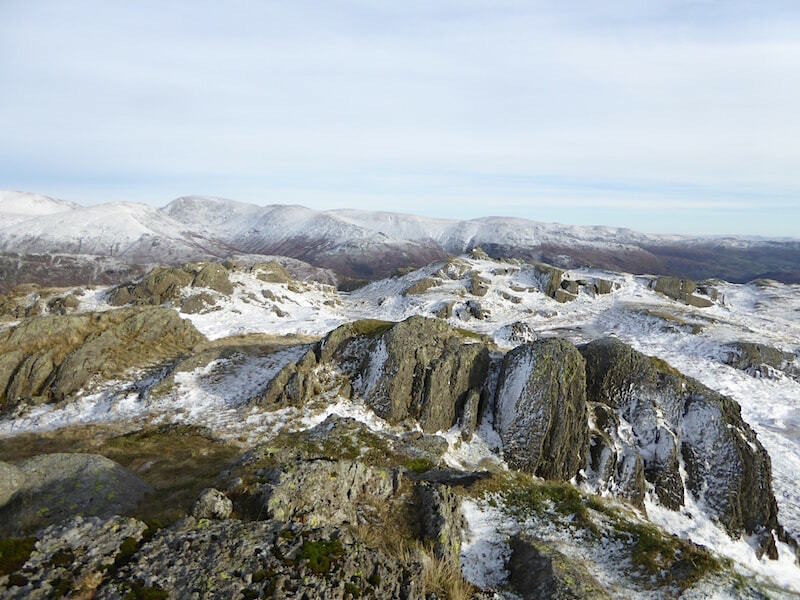 Still on the summit and a look eastwards at where we haven’t been walking today, but I expect plenty of others have. As we make our way down I take a look back at Silver How. The sun had dipped and although we weren’t in darkness the light just wasn’t good enough now for any more photographs and so the camera went back in its bag at this point. 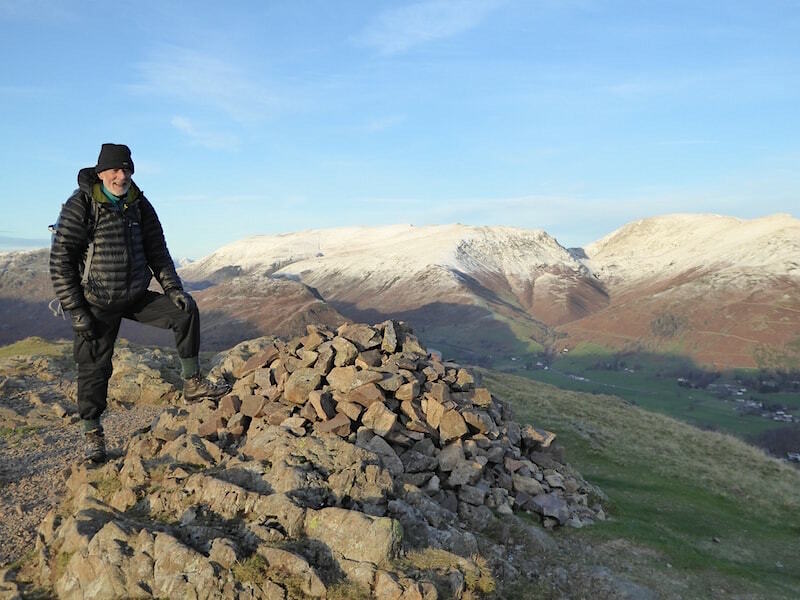 Its sobering to think that until mid December the daylight hours will be getting even shorter and so, therefore, will our walks.